This paper argues that the optional exception to copyright law contained in Article 5(3)(h) of Directive 2001/29/EC should be extended to clearly include commercial uses of copyrighted works, and should be made mandatory across the European Union. Copyright law must be clearly justifiable, requiring a balance between the private interest of right holders and the wider public interest. 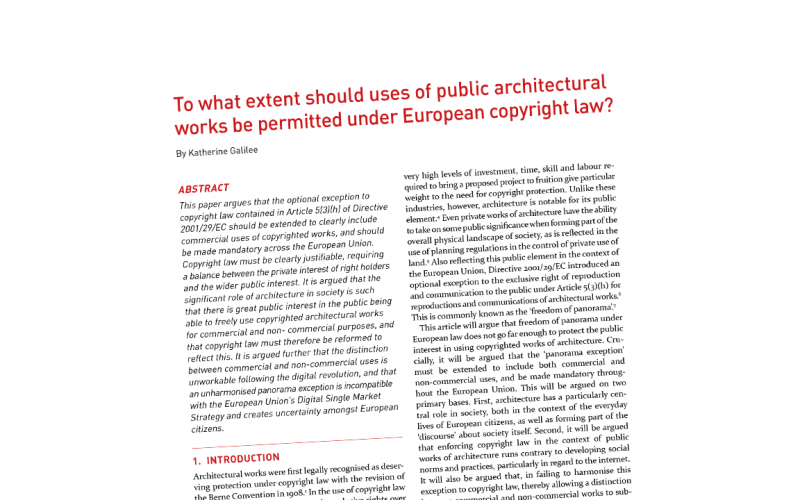 It is argued that the significant role of architecture in society is such that there is great public interest in the public being able to freely use copyrighted architectural works for commercial and non- commercial purposes, and that copyright law must therefore be reformed to reflect this. It is argued further that the distinction between commercial and non-commercial uses is unworkable following the digital revolution, and that an unharmonised panorama exception is incompatible with the European Union’s Digital Single Market Strategy and creates uncertainty amongst European citizens. The Stockholm IP Law Review is the first law review in Sweden, which will publish a journal with a focus on European Intellectual Property Law. Call to all Alumni of the European Intellectual Property Law master program!